Athletics: New Throwing Event Option for 2016! Special Olympics Illinois is excited to announce that it has officially added the mini-javelin as a throwing event option for the 2016 athletics season and beyond! The mini-javelin was demonstrated at various Spring Games last year and elicited a very positive response. Athletes will now be able to choose the mini-javelin as their throwing event option. 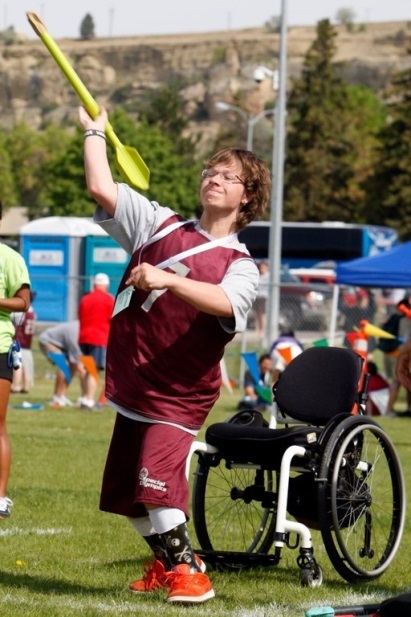 In 2016, Areas have the option of adding mini-javelin to their Spring Games as a qualifying event to Summer Games. Contact your local Area Director to find out if mini-javelin will be offered at your local Area games. Different weights will be offered depending on age and gender (300g & 400g). The mini-javelin is thrown with one hand in an over the shoulder fashion as shown in the image to the right. The athlete will throw with their body facing the landing zone and the measurement will be taken from where the javelin first hits the ground back to the inside of the throwing arc. As with other throwing events, each athlete will receive three non-consecutive attempts at a farthest throw. Special care should be given to throwing technique as proper form will be a point of emphasis. The javelin should not be slung or hurled. If you are interested in the mini-javelin and would like more information, please contact your Area Director or Regional Manager of Sports Training.